Searching for a Marketing Communications Agency Partner addresses the continual evolution of highly specialized MarCom needs in today’s marketing landscape and the complex matrix of agency relationships required to fulfill them. 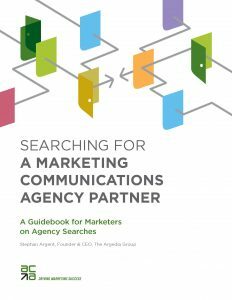 It serves as a valuable reference for marketers when considering a MarCom agency search. helpful templates such as sample search briefs for RFPs, scorecards for grading and a variety of other checklists, samples and forms.